True brick structures (i.e., buildings constructed without the use of any concrete blocks or veneers) should last hundreds and hundreds of years if properly maintained. Given the legendary quality of true brick construction, most prevalent during the 19th century and first half of the 20th century, most of our clients willingly pay a premium for these structures and are very interested in learning how to maintain them. It takes many decades of neglect (benign or otherwise) to make a true masonry structure look as deteriorated as the one at right. 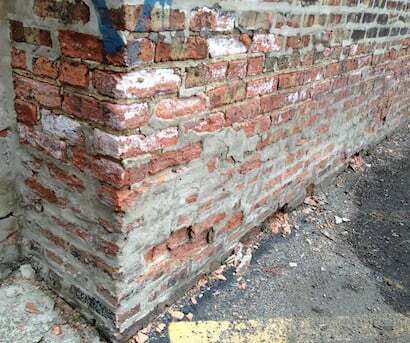 This century-old brick foundation wall could have been saved by grinding & tuckpointing the mortar joints between the bricks when they first started to crack apart years ago. Ignoring the need for minimal maintenance has allowed wind-driven rain, sleet, and snow to infiltrate deep into the brick wall. When all of that moisture inside the wall freezes and expands repeatedly during the winter months, it breaks apart the mortar (and eventually the bricks) allowing the moisture to infiltrate even more deeply into the brick wall. The face of nearly every brick in this wall has spalled (i.e., fallen off) and you can see pieces of the bricks have collected on the ground. Once bricks lose their face, they are much more porous and will absorb wind-driven rain, sleet and snow more deeply into the wall — which leads to accelerated deterioration of the adjacent masonry. It appears that a handyman did try to patch this wall at one time with a sloppily applied coat of gray mortar. You can see that the same mortar was used to patch over the faces of some of the worst bricks, too. Had AAA-1 Masonry & Tuckpointing been called out some years earlier, the brick faces might still have been intact and the required work may have involved only mortar restoration (i.e., grinding and tuckpointing). In our business, preventative maintenance can preserve a masonry wall for a long time and for much less money than full-blown brick replacement, as is needed here. True brick construction requires much less regular maintenance than new brick-and-block construction or trendy split-face block walls, but it does require some maintenance. If you call us out before your beautiful true masonry walls deteriorate to this point, then the scope of work required will be much less… and so will the cost.